Ice: A friend and enemy! I love ice cream. But I'm also very lazy. So obviously, a no-cook ice cream base will always be the holy grail for me! no time at all wasted waiting for the mixture to cool down! So, you work less and get to eat ice cream sooner. What's not to love? Well, the problem is that most no-cook ice creams are horrible. Bleugghh. Too fatty and sweet for me. And it gets really icy, really quickly in the freezer. And this is the problem with most no-cook ice creams. In order to work without cooking, they're often loaded up with fat and sugar. And because they don't use eggs or anything else to stabilize the ice cream, they quickly deteriorate in the freezer. There's loads of ways round this using fancy sugars and stabilizers. But most people don't have easy access to these ingredients. be made from easily available ingredients. Not easy, it's true. Almost every recipe on the internet (and to be honest, there aren't many that don't use the aforementioned Philadelphia base), uses far more cream than milk and I know that means they're going to be too fatty for me. So I tried this and it was pretty good. Clean and milky with a nice firm body. The condensed milk gave the ice cream a slightly chewy texture and a very subtle cooked flavor that was in fact, quite nice. The liquid sugar in the condensed milk no doubt helped control the ice crystals. However it was still a little bit icy. And it did get more icy, quite quickly in the freezer. And in the end, I decided the condensed milk gave the ice cream slightly too much chew. It was a bit toffee like. But this recipe was good starting point. All I had to do was reduce the condensed milk and control the iciness. The thing is, removing some of the condensed milk was actually likely to increase the iciness. I had to replace it with something else. Enter skimmed milk powder (SMP). It's easily available in the supermarket, it will replace the milk solids from the condensed milk and by soaking up the water in the milk, it should also help control the iciness. But by replacing some of the condensed milk with SMP, we're also reducing the sugar level. On one hand, this is great as it allows us to taste more of the dairy flavors. But on the other hand, less sugar means the ice cream will freeze much harder in the freezer. We could add a tablespoon of vodka to help keep the ice cream softer in our freezers. But I just leave it out a good five minutes before I serve it, to soften up. And this works fine! Any ice crystals that melt while left out, will re-freeze as bigger crystals back in the freezer. I wanted to control this by adding extra stabilization. And with luck, this should also improve the general smoothness and creaminess of the ice cream. But what to use? Eggs are what we'd usually use. And while there are recipes that use raw eggs in un-cooked ice cream, I didn't think it would appeal to many people! The thing is, most other stabilizers require heating to trigger them. For example, cornstarch, tapioca starch, locust bean gum all need to be heated or they won't work. The only ones I can think of that don't are Guar Gum and Xanthan Gum. While Guar Gum can still be pretty difficult to get hold of, Xanthan Gum is often used by vegans as an egg replacement in baking. So it should be in the health section of most big supermarkets. Or if not, your local health food shop. With Xanthan Gum a little goes a long way. We don't need much and in fact, if you do use too much it can give the ice cream a slightly slimy texture. So be careful! Your measurement need to be exact. You don't have to use any Xanthan Gum, but it will definitely make this ice cream better. It will be smoother coming out of the ice cream maker and will take longer to go icy once it's stored in your freezer. I actually prefer this base without any vanilla. But if you want that flavor don't add too much or it will overpower those dairy flavors. And always use either vanilla beans or proper vanilla extract. The vanilla essence stuff is artificial and nasty! 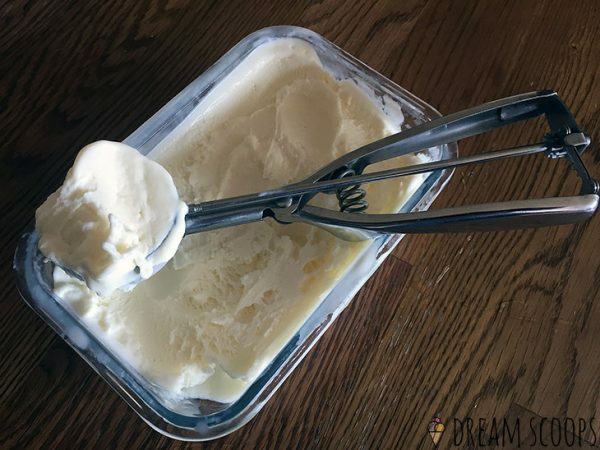 This is the perfect no-cook vanilla ice cream for the lazy ice creamer! Just mix everything together and add to your ice cream maker. More milk than cream gives it a nice clean taste. The skimmed milk powder, sweetened condensed milk and Xanthan Gum give it a smooth texture, a firm, slightly chewy body and a creamy mouth-feel. Just like all the best ice cream, but with none of the faff! Add the skimmed milk powder, sugar, xanthan gum and salt to a bowl and mix thoroughly. If the xanthan gum is not completely mixed into the sugar before we add the liquids, it won't work properly. Add the milk, cream and sweetened condensed milk to the bowl. They should all have been thoroughly pre-chilled in the fridge. If you're using a vanilla bean, cut it open and scrape the beans into the mixture. If you're using vanilla extract, just mix it in. Blend the mixture for 1 minute. It should start to thicken up to reach the consistency of a thin custard. Place the mixture in your fridge or freezer. This is an optional step. But the colder you can get it before you put in the ice cream maker, the better the final texture. Place the container that you're going to store the ice cream in in the freezer to pre-chill. This will reduce melting while you're transferring the ice cream to the freezer. Prepare your ice cream maker. If you're using a compressor machine, turn it on for 15 minutes to pre-chill before you add the mixture. If you've left the mixture in the freezer for too long and it's started to freeze slightly, give it another quick blend. Add the mixture to the ice cream maker and turn it on. The ice cream will be ready after 20 to 30 minutes, when it starts to come away from the sides of the bowl and has the consistency of soft serve or whipped cream. Stop the machine and quickly transfer the ice cream to your pre-cooled container. Place a layer of cling film or baking paper over the surface of the ice cream, to discourage ice crystals developing. Then add the lid and place the container in the back of your freezer for 2 to 4 hours to harden up. Remove the ice cream from the freezer and allow to soften for 5 minutes before serving. Fior di latte is perhaps the simplest, purest ice cream of all. It’s a Sicilian gelato and fior di latte translates from Italian as “flower of milk”. Or “the best of the milk”. And that’s all it is: a sweetened, milky ice cream. No eggs. No vanilla. Nothing but milk, cream and sugar. I’ve seen it described as “monastically simple”. And while there is something quietly spiritual about those soft, white waves, there should be nothing austere about this gelato. Thick, dense and creamy, as long as it’s not too sweet there’s a whole load of complex dairy flavors to explore here. For many, a Fior di latte is the best test of a gelato shop. I suppose because any shortcuts an inferior gelateria might try to hide behind other flavors will be starkly apparent in their Fior di latte! And that’s why it such a great place to start when you start learning to make ice cream. You can really concentrate on finding a balance of sweetness and creaminess and a texture and body that work for you. I recommend making it again and again and again! In this recipe I’m using 3.5% full fat milk. You could use semi-skimmed or even skimmed. But then you’d need to adjust the recipe. This because when the milk is combined with the cream, we’re looking for a 7% total fat content. So if you use lower fat milk, you’ll need to use a higher proportion of cream. Why 7%? Any less and it starts to taste a bit “hard” and “metallic” to me. And the sweetness is accentuated so it can start to taste like candy. Any more and the creaminess can leave a slightly cloying aftertaste. Although it’s called Fior di latte, every recipe I’ve ever seen contains some amount of cream. And as I mention above, with too little cream it starts to taste a little “hard” to me. There is in fact a variation called Fior di panna (“flower of cream”, obviously). But it’s not clear to me at what point the amount of cream means it’s a Fior di panna rather than a Fior di latte! Anyway I’m using 36% fat cream. You can of course use cream with a different fat content. Just be aware that you won’t get the 7% fat that I’m aiming for without adjusting the recipe. Most ice cream tastes far too sweet to me. But we don’t use sugar just for the sweet taste. It also keeps the ice cream thick and soft and stops it getting icy. So we can’t just use less sugar when we want a less sweet ice cream. What we can do, however is use different types of sugar. This is because different sugars have different levels of sweetness. So here we use a combination of table sugar (sucrose) and the less sweet dextrose. Dextrose (also called Glucose) is only 3/4 as sweet as table sugar. So if we replace some table sugar with dextrose we still get all the structural benefits of sugar, but the ice cream will be less sweet. Dextrose also reduces the freezing point of water more than table sugar, which means our ice cream will be softer too! With no eggs to emulsify and stabilize this low fat gelato, we need to add something else to thicken the ice cream and stop it becoming icy and coarse. Fior di latte gelato probably originates in Sicily and is essentially a frozen crema rinforzata which is a sweet milk pudding, thickened with cornstarch. And we could use cornstarch here. But it’s a little bit more difficult to make Fior di latte with cornstarch. And more importantly, I’ve never managed to do it without being able to taste the cornstarch in the final gelato. Locust Bean Gum works in the same way as cornstarch but is much more effective, much easier to use and most importantly: adds no discernible taste to the final gelato! You probably won’t be able to find it in your local supermarket. But it’s widely available online, it lasts for ages and as we’ll see, a little goes a long way. Add the table sugar and the dextrose to a deep saucepan. Add the Locust Bean Gum to the saucepan. Unless you have specialized scales, it will be difficult to weigh 3 grams accurately. So, 3 grams is about the same as 1 ¼ compact teaspoons. Use a fork to thoroughly mix the dry ingredients. This part is really important. If the Locust Bean Gum isn't thoroughly mixed into the rest of the dry ingredients before you add the milk, it won't work properly. Add the milk to the saucepan and warm over a medium heat, stirring all the time to dissolve the dry ingredients. Keep stirring and checking the temperature with a digital cooking thermometer until the mixture reaches 185° F / 85° C.
Remove from the heat and allow to cool to about 149° F / 65° C.
Then add the cream and blitz for a couple of minutes with a hand blender. Transfer to a bowl and when the mixture stops steaming, cover with cling film and allow it to cool to room temperature. Put the bowl in the fridge until it the mixture cools to at least 45° F / 7° C. You'll get the best results if you leave it overnight. Place the container that you'll use to store the ice cream in the freezer. This will pre-chill it, so it's less likely to melt the ice cream when you're transferring it from the machine to the freezer. Remove the mixture from the fridge and give it another quick blitz with a hand blender. Turn on your ice cream maker and add the mixture. After around 20 minutes the mixture should have thickened up and have a texture like soft serve ice cream. As quickly as possible, transfer the mixture to the pre-chilled container and put it at the back of the freezer where it's coldest. After around 1 hour, the ice cream will have hardened up and be perfect for eating. It doesn't keep well though and will start to deteriorate after just one night in the freezer. So eat it quickly! Everything about ice creams, gelatos, sorbets, sorbetos and other frozen treats!